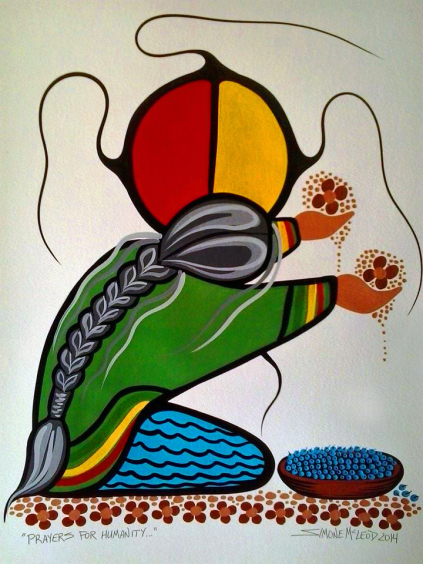 Contact Simone McLeod or Zhaawano Giizhik for inquiries about a custom painted reproduction of the original. The above painting is like a prayer. I painted myself sitting on earth's blanket of flowers because that's my name: Earth Blanket, or All That Covers The Earth. I offer the flowers in humility and thankfulness for all Creation, and as a prayer for the healing of all Peoples. I also put a bowl of blueberries in there because where I come from, blueberries are offered in sweat lodge healing ceremonies. 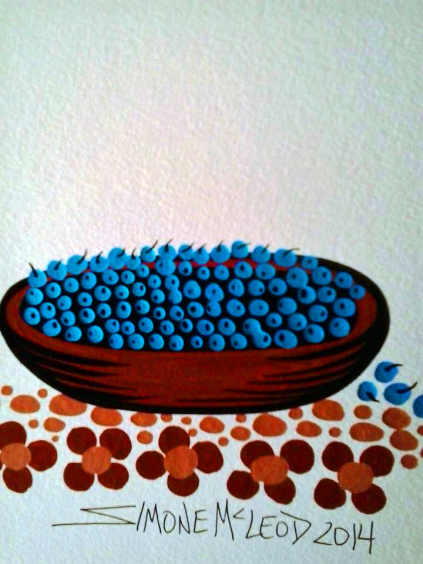 A bowl of blueberries, detail of the the painting A Prayer For Humanity by Simone McLeod. This is so beautiful and puts me in a prayerful mode. Thank you for placing the healing blueberries in their sacred place.